Like Auburn, Fairfield is a suburb with a less than stellar reputation. I'm not one to knock something before I've tried it, so here's my take. 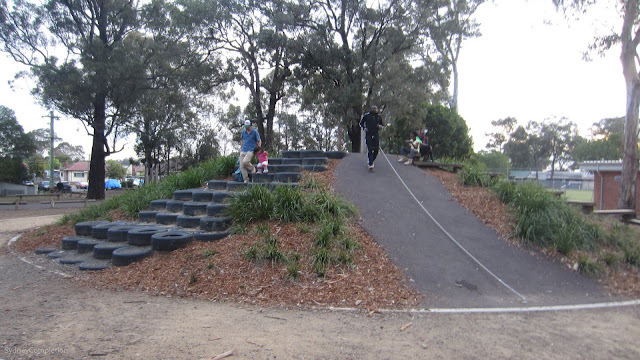 As you might expect, Fairfield is just a short drive from our previous suburb, Fairfield Heights. 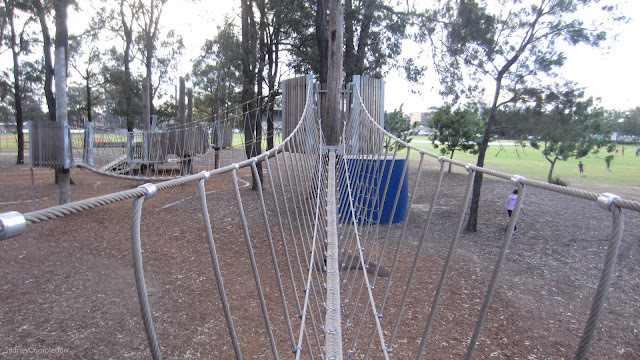 On the map, I saw the very enticingly named "Fairfield Adventure Park". Never one to back down from an adventure, it seemed like the perfect place to start the suburb. Talk about a top shelf park. 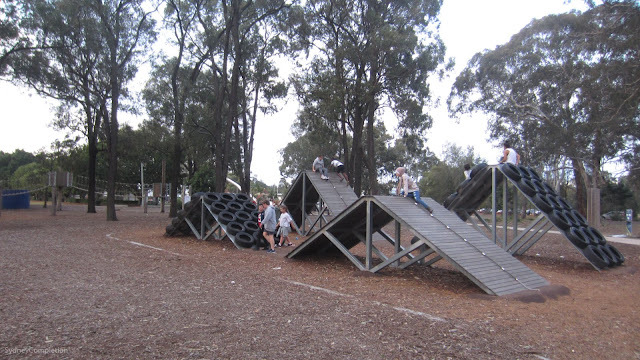 as well as triangles up the wazoo. 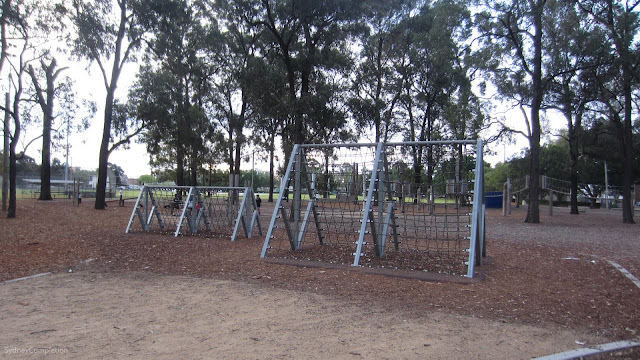 Even though my Fairfield-companion and I had a whole wide suburb to explore, and barely any sunlight left in the day, we found ourselves playing on the play equipment anyway. These balancing ropes were actually surprisingly scary! Deeper into the park is this climbingly-delicious abomination. If you've got kids, Fairfield Adventure Park seems like an amazing place to take them for a cheap (free) afternoon of entertainment. 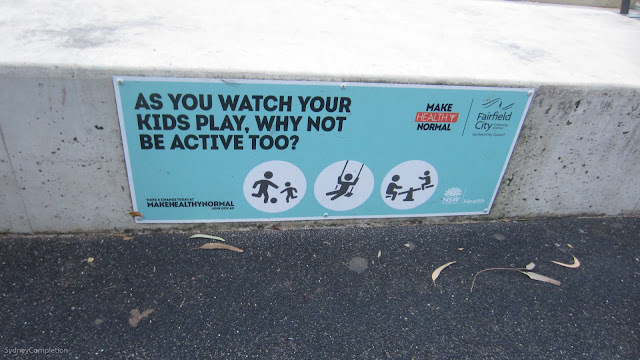 This sign encourages adults to get involved too (they claim its for health purposes but I maintain it's because running around and climbing is fun). 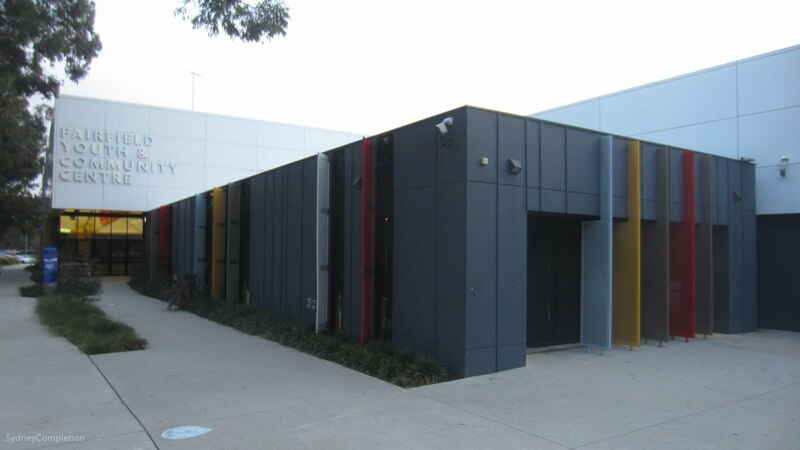 Just by the park is Fairfield Youth & Community Centre which sits in a pretty funky building (if you like your buildings to look like plastic furniture from Ikea anyway). If you continue along past the community centre, you end up at what is known as "Honour Avenue". 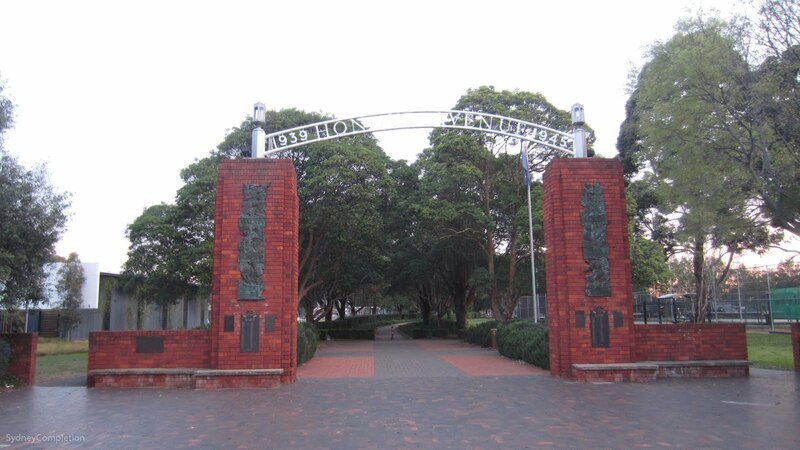 Honour Avenue is a war memorial featuring a gate and tree-lined pathway back into the park. Interestingly, the monument features the engraved names of Fairfield residents who died at war. From here, the intention was to head to the main commercial area of Fairfield which is the streets around the train station. To get there, we walked through a few residential streets. I was supposed to pay attention to and comment on the houses of Fairfield, but instead we were stunned by a great Aussie "lemon lime bitters" sky. 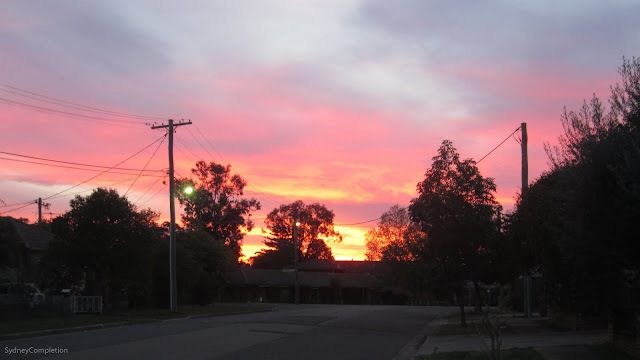 We were even treated with a large flock of birds enjoying the dusk sky. 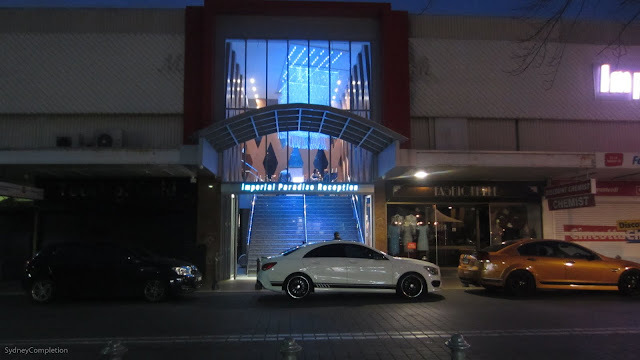 Arriving at Fairfield's commercial centre, we realised that we made an error in judgement and the suburb is actually fairly sleepy at night. 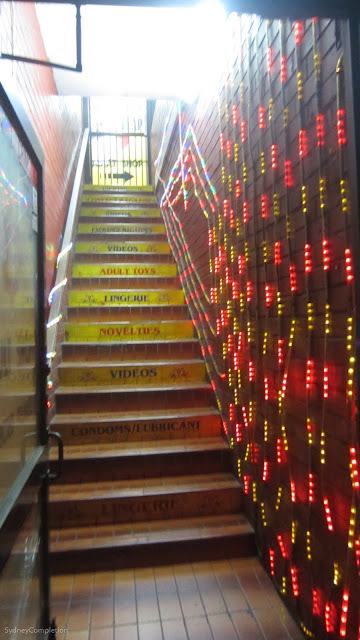 Regardless, there were some interesting sights. The largest, but not only, demographic in this suburb is Iraqi and as such, Middle-Eastern stores and Arabic writing are a common sight. 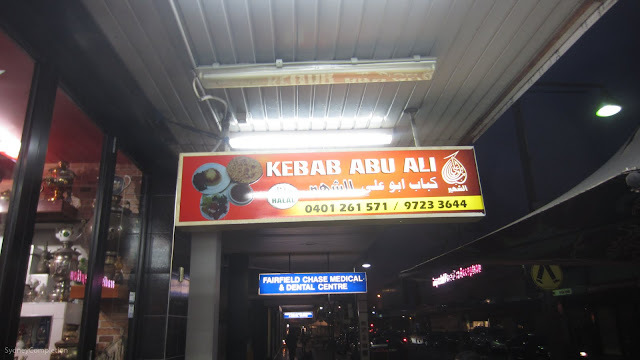 We spotted this very chic middle eastern restaurant which goes by the highly stereotypical name "Kebab Abu Ali". Fairfield also boasts this reception hall which I can only describe as "Western Sydney Bling". 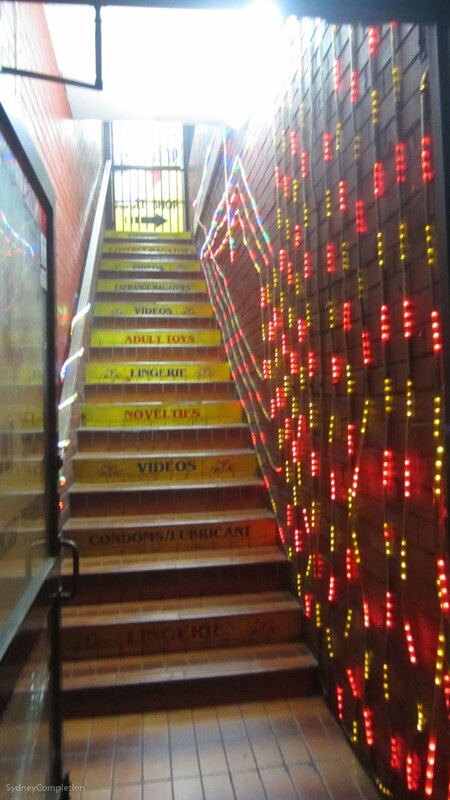 Speaking of bling, this is an adult store which has brought out maximum bling to try and get clients into the store. 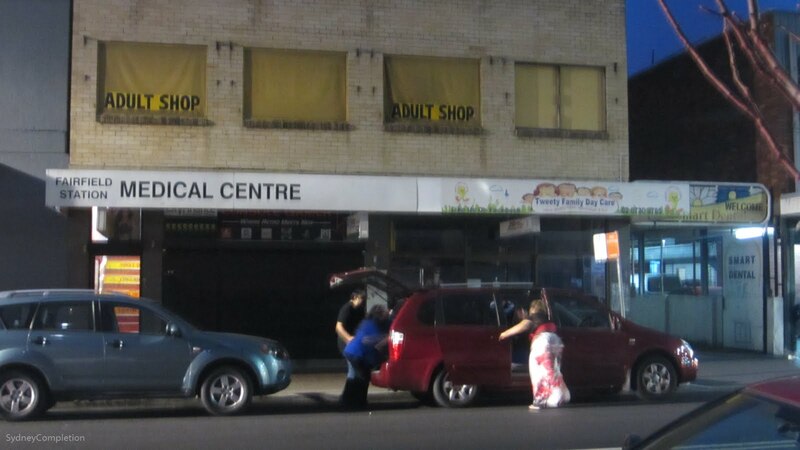 Somewhat amusingly, it shares a building with "Tweety Family Day Care". If I'm to be honest with you, I really only came to Fairfield for one reason. 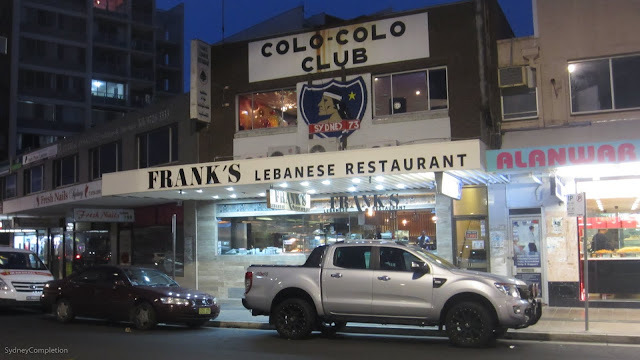 This is Frank's. 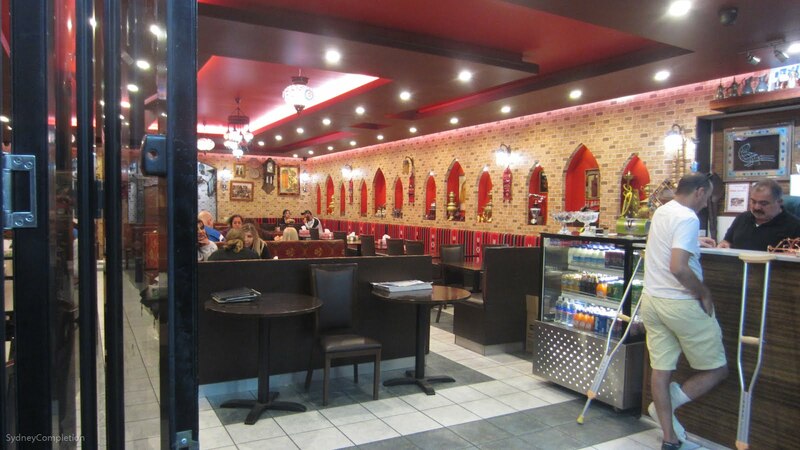 They're a Lebanese restaurant. Many years ago Frank's served me the best falafel I'd ever had in Sydney. Now I'm back with a vengeance. 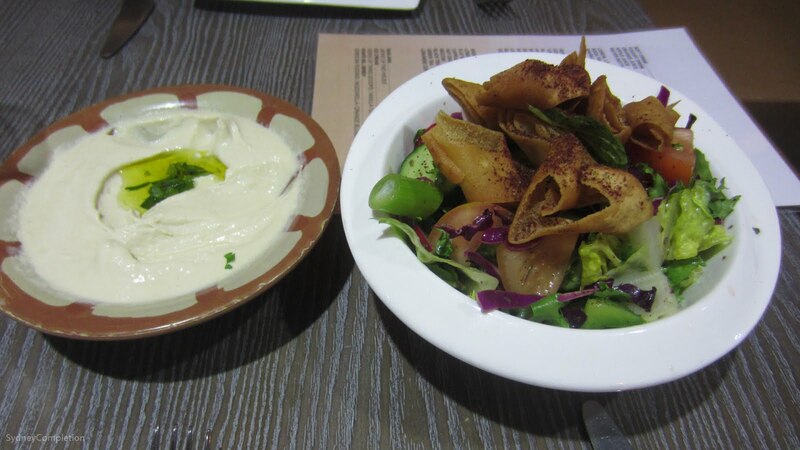 While we were here, we also ordered fatoush (a zesty Middle-Eastern salad with crisp lettuce, fried bread and sumac) and hummous. 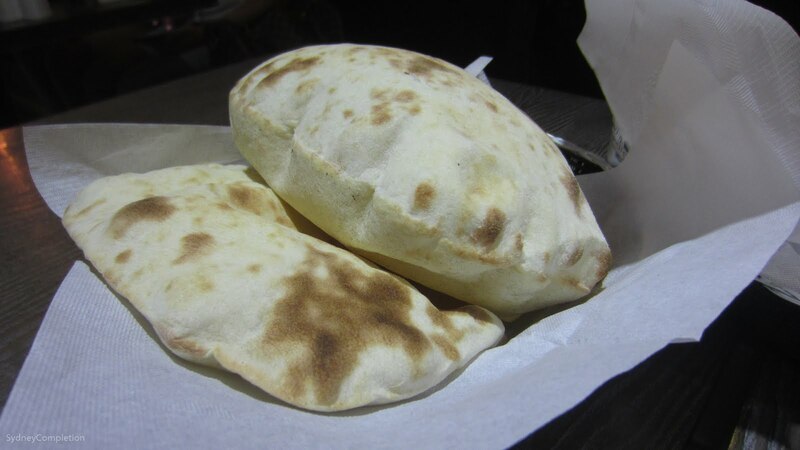 Our table also came with this cool puffy bread I don't know the name of. 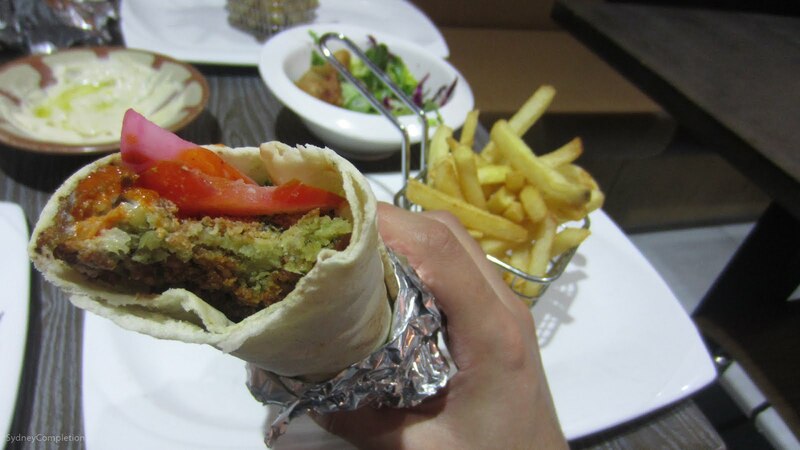 This isn't a food blog, but check out this falafel roll (always add chilli to your falafel rolls if you know what's good for you). As good as I remember? I'm not sure, but it definitely hit the spot. The chips were solid too (dat chicken salt). 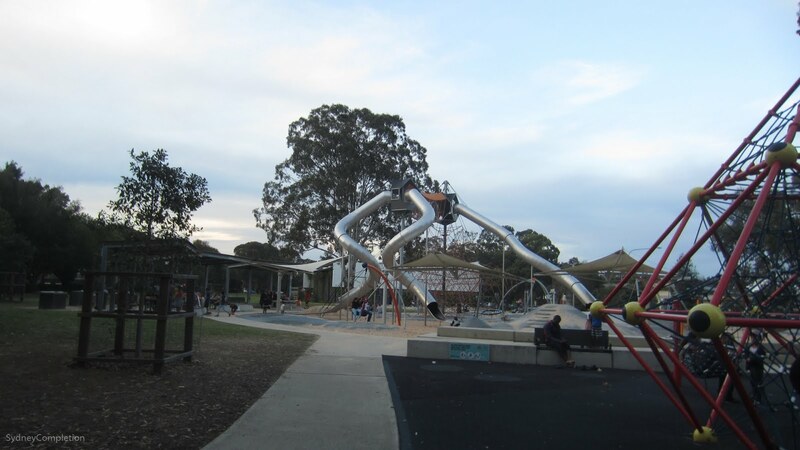 Fairfield: I came expecting culture but spent too long playing in the park. Doesn't matter; had falafel.